Save the Date: April 13, 2019 | 8:00 a.m. – 1:30 p.m.
A Time to Heal’s fifth annual The Art of Living Beyond Cancer Conference will take place on Saturday, April 13 at the Scott Conference Center. The conference will feature Olympic gold medalist, author, humanitarian and cancer survivor Scott Hamilton as keynote discussing “Making Every Moment Count.” This event is for survivors, caregivers and health professionals and brings together the best information and resources for anyone whose life has been touched by cancer. Words of Hope is going digital! We are excited to keep you informed of news, upcoming events and stories of inspiration through the Harper's Hope Cancer Survivorship Program at Methodist Estabrook Cancer Center. To ensure you keep receiving Words of Hope, please subscribe to our digital newsletter at http://www.harpershope.org/subscribe. If at any point you no longer wish to receive this newsletter, you may select "unscribe" from the bottom of the e-mailed newsletter. Questions on how to subscribe? Please contact us at www.harpershope.org/contact. 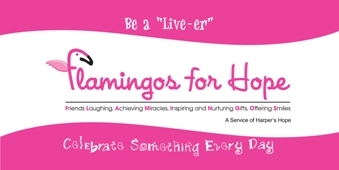 The Flamingos for Hope will visit patients at Methodist Estabrook Cancer Center on Monday, November 19th at 10 a.m. Flamingos for Hope is a patient-led program developed by a cancer survivor who chose to “be a live-er” and to celebrate something every day. Flamingos represent Friends Laughing, Achieving Miracles, Inspiring and Nurturing Gifts, Offering Smiles. The mission of Flamingos for Hope is to enrich the quality of life of those touched by cancer through inspiration, fun and laughter.